A hundred years ago, on 25 November 1915, Einstein presented his general theory of relativity to the world. But what exactly is this famous theory and what does it say about the world we live in? To celebrate the centenary of general relativity we bring you a collection of articles, videos and podcasts exploring the theory, Einstein's struggle to find it, and some interesting consequences. Einstein and relativity — This two-part article traces Einstein's bitter struggle for his greatest achievement and explains what it means in simple terms. The article is based on a talk by the physicist David tong, given to an audience of 16 and 17-year-olds. You can watch a video of the talk here. Steady on, Einstein — A recent discovery of one of Einstein's unpublished papers shows how he explored the consequences of his general theory of relativity, and that even a genius of Einstein's calibre can occasionally be lured down a blind alley. You can listen to a version of this article as a podcast. Problems of gravity — Despite the success of general relativity, some physicists are doing what many would consider sacrilege: they are tinkering with the theory, producing modified versions of it. But why? 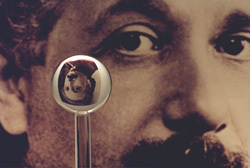 This image shows one of the most perfect spheres ever created by humans: a fused quartz gyroscope for the Gravity Probe B experiment, refracting the image of Albert Einstein in the background. Image courtesy NASA. What's wrong with general relativity? The problems of general relativity arise when you look at the Universe at very small or at very large scales. So, what's wrong with general relativity? In fact, first, general relativity is made based on thought experiment, not the real experiment. Secondly, Einstein's thought experiments are incomprehensive, illogical, and misleading. Third, Einstein never proved general relativity. Fourth, Einstein ignored the refraction of light and the existing of celestial sphere, that's why Einstein proposed the test for his hypothesis deflection of light by the Sun isn't scientific and deeply wrong. Einstein's proving method need to be examined more thoroughly and need to be taken seriously. “Einstein proposed therefore, that photographs be taken of the stars immediately bordering the darkened face of the sun during an eclipse and compared with photographs of those same stars made at another time.” (LincolnBarnett, The Universe and Dr. Einstein, London, June 1949, Preface by Albert Einstein Himself, page 78). Actually error in the famous eclipse experiment of 1919, but F.W.Dyson writes: “It seems clear that the effect found must be attributed to the Sun’s gravitational field and not, for example, to the refraction by coronal matter” (F.W.Dyson, F.R.S, A Determination of the Deflection of Light by the Sun’s Gravitational Field, from Observations made at the Total Eclipse of May 29, 1919).